Being that Downtown LA is the heart of the city, it’s only fair to dedicate an entire day exploring. We’ll get started off with some breakfast, the most important meal of the day, before hitting the sights. Get your caffeine fix at a celebrated brewhouse before tackling the rest of the day. What’re you waiting for, get moving! Good morning! And what a morning it is when it starts at the epicenter of LA’s food scene (it’s almost so cool it’s earth-shaking!). Grab a famous sandwich from Eggslut and hit up G & B Coffee for some top notch caffeination. This place is also great for people-watching as you sample foods from around the world and watch the fast-pace life of street food, which is synonymous with LA. Fill up and keep goin’! Are you a Blade Runner fan or a closet aesthete? Then make the Bradbury Building your first stop after breakfast. A masterwork of ironwork architecture dating back to 1893 (making it the oldest building remaining in the central part of the city), the building houses intricate staircases and a glass ceiling where you can gaze up at the heavens. You can only go up to the second floor, since the rest is private offices, but that’s just fine, because it means you get to check out one heck of a view. Look up. Get your fix for history and cheap thrills up next by taking a ride on this steep 20th-century rail line—for only a dollar. Operating off and on for over a century, it still draws tourists and some locals for unforgettable rides. It’s not a bad view either. Even if there’s no room left in your bookshelf, a visit to this next location is a treat. Drop some dough on literary favorites, vinyl records, and gifts, or peruse the art exhibitions made of, yes, books! The book-related installations will make you feel like you're in an alternate universe where books have come to life. Tired of all those words? Then you can head upstairs to check out the art collective. All that reading will work up an appetite. Travel back in time, over a century to be exact, for this next meal. Philippe's opened in 1908 and they've been serving French dip sandwiches for almost as long. Regardless of whether they invented it the brusque, the efficient staff at this LA favorite make a mean one. Pro-tips: decide what you want long before you get in line, and try the spicy mustard. We wouldn’t normally send you to a train station, but you’ll see why you’re here when you enter this beaut. 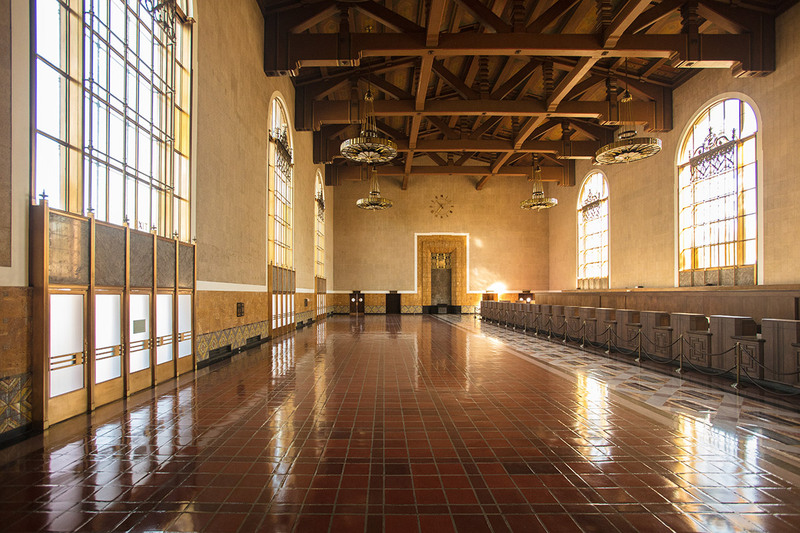 Union is the largest railroad passenger terminal in the western United States. It combines Streamline Moderne, Art Deco, and Mission Revival architecture to produce a breathtaking setting so incredible that it’s a wonder just to be there. You’ll probably miss your train drooling over the details and the history. At least the next stop is just a short walk away. Olvera Street is LA's most colorful corridor. Packed with Latino history, amazing foods, and local shops, it's a tourist trap worth getting lost in. Take a tour to learn about its culture and Spanish past or stop by for the holidays to see folk dances and parades. It’s especially cool during Mexican holidays! Visit in October for Dia de los Muertos to honor the dead and catch the coolest spooky decorations in town. Badmaash literally translates to badass in Hindi, and this irreverent Indian-fusion gastropub certainly lives up to its name. Get some beers, some lamb burgers, chicken tikka poutine (the owners are Canadian) and tandoori broccoli, and a big group of friends for a guaranteed good time. When you open the orange door at Everson Royce, you'll find expert cocktails and a short but oh-so-sweet food menu to end your night Downtown. With an intimate interior and a sprawling patio, this hip, multipurpose playground could be your new after-work hangout, or just the perfect way to round out the night. Cheers to a wonderful day!